The bonkers rowers I met at the Earl's Court Boat Show last year are now on their way from Australia to Mauritius, and by the magic of the internet you can track their progress at the Indian Ocean Rowing Race website. The Ocean Angels (rowing Pura Vida) are about 500 miles into the 3,000 mile voyage, and Guy Watts and Andrew Delaney (Flying Ferkins) are over 200 miles out, which shows the big advantage of having four rowers rather than two. Both crews are blogging from the boat, and great reads they are. Ocean Angels in particular sounds as if they are going through hell, what with the heat, adverse conditions making rowing impossible for days at a time and salty drinking water. Go girls! The boats are only 11 days out and already three of the 11 boats have had to retire. It is clearly a tough race. 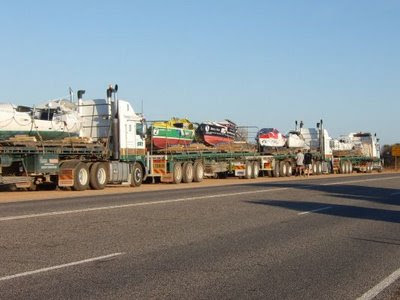 No pictures of the boats under oars yet, but this picture of the boats arrival at Geraldton, on the coast of Oz north of Perth, is impressive.